We sell utility trailers! Contact us for details. We are thrilled to announce that we are Ontario's newest KTM dealer! 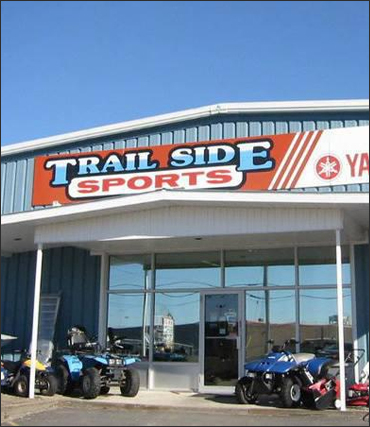 Trail Side Sports Ltd. in Espanola, Ontario, we have switched gears and made the bold move of adding the amazing Polaris Industries family of products to our already industry-leading lineup. We now carry a full selection of Polaris ATVs and ORVs (Rangers and RZRs), Polaris snowmobiles, Suzuki ATVs, Suzuki motorcycles, Yamaha ATVs, Yamaha motorcycles, Yamaha snowmobiles, Yamaha outboards, and Yamaha generators. We supply the fisherman and cottager alike with boats by Crestliner and Naden, powered by Mercury and Yamaha outboards. We offer seasonal boat storage indoors and outdoor, as well as shrink wrapping in our secure compound and storage buildings. For the yard care and wood cutting enthusiast, we are proud to be a STIHL dealer, the world's best-selling chainsaws, trimmers, and accessories. We offer both sales and service of everything we sell. In 2010, we also added cargo trailers to the selection of top quality products on our lot. We carry open trailers by Sure Trac, as well as enclosed cargo trailers by LOOK Trailers and PACE AMERICAN. Our factory-trained techs are ready for all aspects of equipment repair for the brands we represent. We offer boat storage and winterization, motorcycle service, safety inspections, tire installation, snowmobile pre-season and in-season service, and full ATV and ORV repairs. If you're near Sudbury, Manitoulin, Elliot Lake, the Northshore, or Sault Ste. Marie, stop by our retail store in Espanola, Ontario today. If you're outside of Northern Ontario, browse our extensive online showcase. Call us at (705) 869-0170 for the latest sales or promotions from Polaris, Yamaha, Suzuki, Mercury, and Crestliner, or feel free to drop us an email at kevin@trailsidesports.com.